As you may recall if you follow me on Instagram, I co-hosted a blogger brunch a couple months back with my dear friend Morgan, who recently launched her namesake clothing line, Morgan James! Morgan’s inspiration to start her collection comes from her roots – her father owned a clothing line years ago, and she grew up sewing dresses with her grandmother. Her debut line contains wearable, feminine pieces like the Maxwell dress, the Flare dress and the Everyday dress, with a few edgier pieces like the Drape jacket, this vegan leather fringe vest, and these sleek leather-effect leggings. What’s my favorite piece, you ask? The Drape jacket, of course. The leather details and oversized lapels take what could have been an ordinary blazer to a whole new level of cool – the Drape jacket is so versatile too! 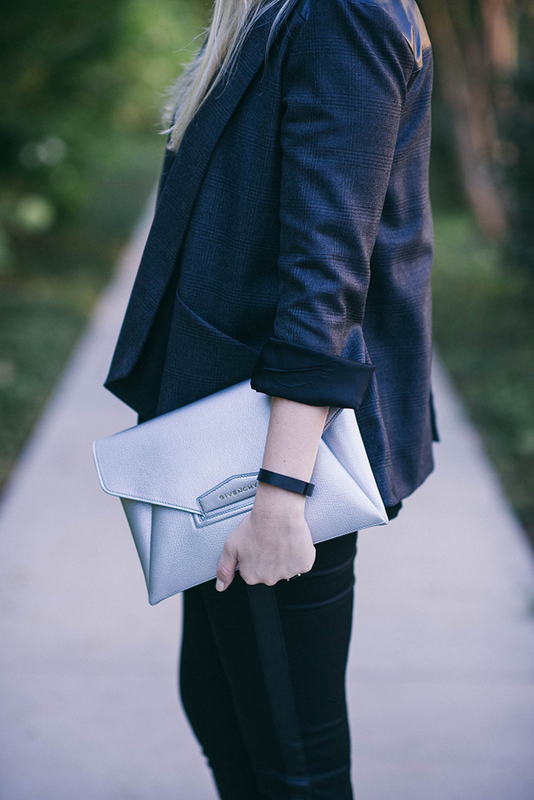 Perfect for weekdays at the office, but with a change of accessories it’s ideal for a night out in this crisp fall weather. It comes in a dark, plaid printed wool or an ice gray shade. 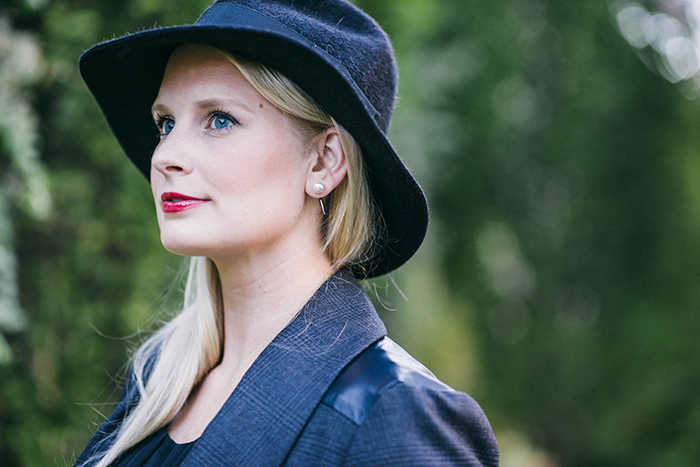 Since I love wearing black, the darker jacket is an easy choice for me. One thing I should also mention – Morgan was pregnant when the line came out (just gave birth to a beautiful baby boy last weekend!) and was able to wear a lot of the collection throughout her pregnancy. This dress (also comes in this print) and this maxi are stretchy and super comfortable maternity options for those of you needing that! Click here to check out the rest of Morgan’s collection and be sure to peruse the lookbook – gorgeous photos and styling suggestions! I also wanted to mention the jeans in the first look. Last week week I stopped by a party at Elements Boutique in Dallas to support my friend Devon who was co-hosting the event with TROA Jeans. This new-to-me brand started in Korea, where the founders (Troa Cho and her son, Song) utilized traditional Korean paper artistry to transform mulberry bark into luxury denim. Each piece of denim is dyed naturally too! The team was nice enough to gift me a pair, so I chose the Tuxedo jeans. I don’t have a style like these in my closet yet – they’re more elevated and dressy than the rest of my denim, so they’ll be perfect for day-to-night! Another style I love is the Crosby Mid-Rise Cigarette jean – the zipper detail and skinny fit are flattering and fun, don’t you think? If you’re in Dallas, head over to Elements Boutique on Lovers Lane to shop the TROA collection! If you’re not in Dallas, shop the collection here. LOVE these VInce shoes. 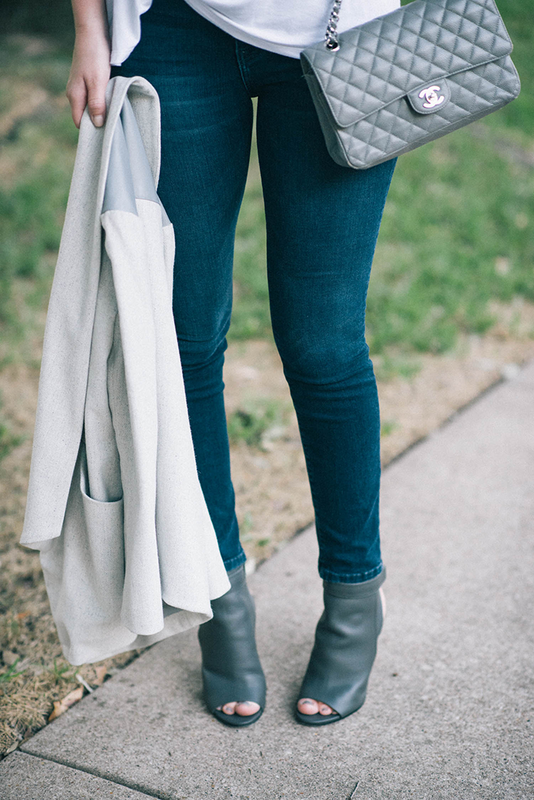 Great color and perfect fall booties. 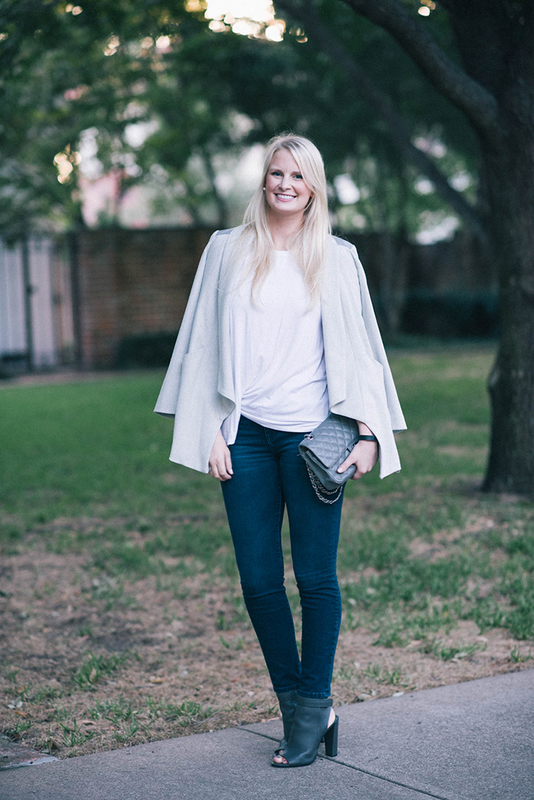 The Morgan James jackets are to die for, I love them! I am going to have to check out this clothing line! It is simply stunning! I love your jackets and bags as always! Love both looks, I especially like the tuxedo pants and Vince shooties. so pretty, love the monochromatic looks! Ok, where do I begin? 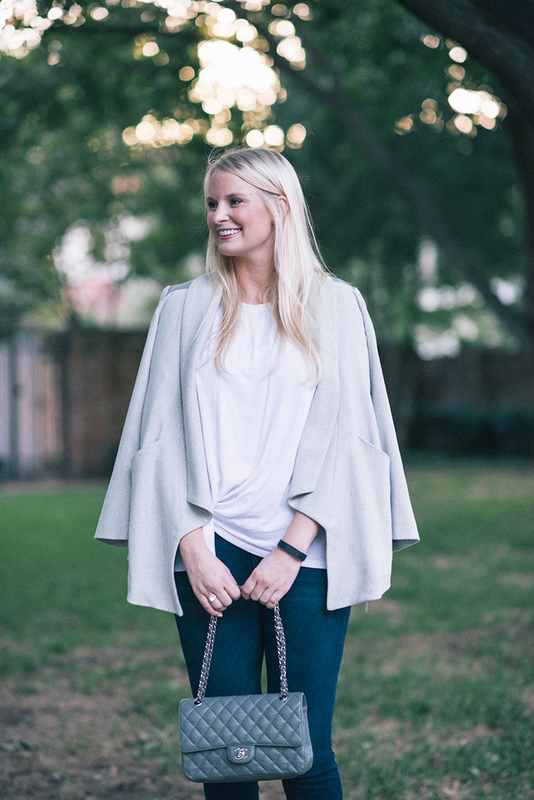 First of all, I LOVE both jackets by Morgan James! Pinning to my Wish List asap! And those tuxedo jeans are seriously perfect!! I adore both looks here because they can easily segue from day to night. So versatile and timeless! Ah, I love both looks! 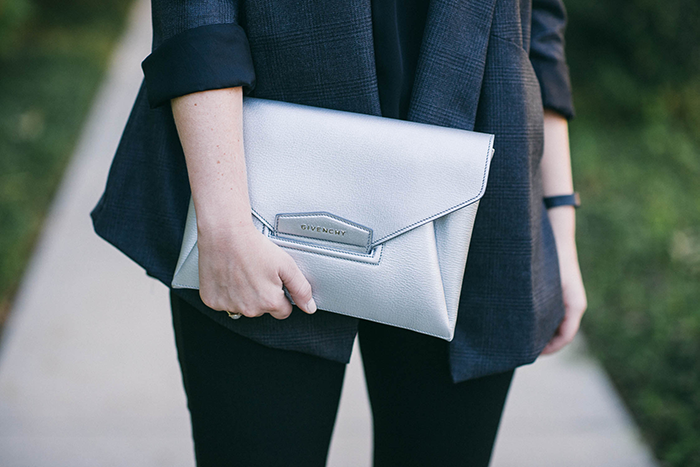 Mainly your new Givenchy clutch and those Vince booties! Both those looks are great! Loving the jacket especially in the first look! Both of these looks are amazing, but girl I am really really loving those peep toe booties! The grey cape/jacket is gorgeous. My fav! LOVE both of these looks! That grey jacket is my fave. Both of these looks are so freakin chic! Love the jackets especially! Love both of those looks, so chic!! Dying over those thick heeled black pumps! Love both your looks! You have such a great style! These looks are SO me!!! Fall perfection Merritt!!! 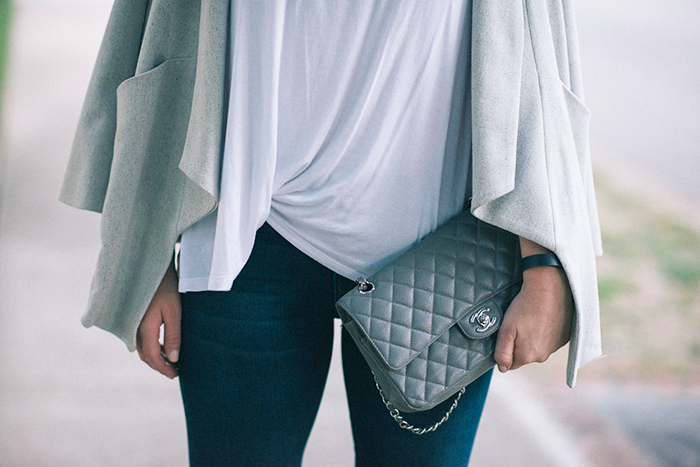 The draped jacket is amazingggggg! Absolutely loving both looks! I especially love your Givenchy clutch in the first look, and how it stands out against the darker clothes! Check out my blog for details on the Austin Blogger’s Giveaway where you can enter to win $100 to Anthropologie! 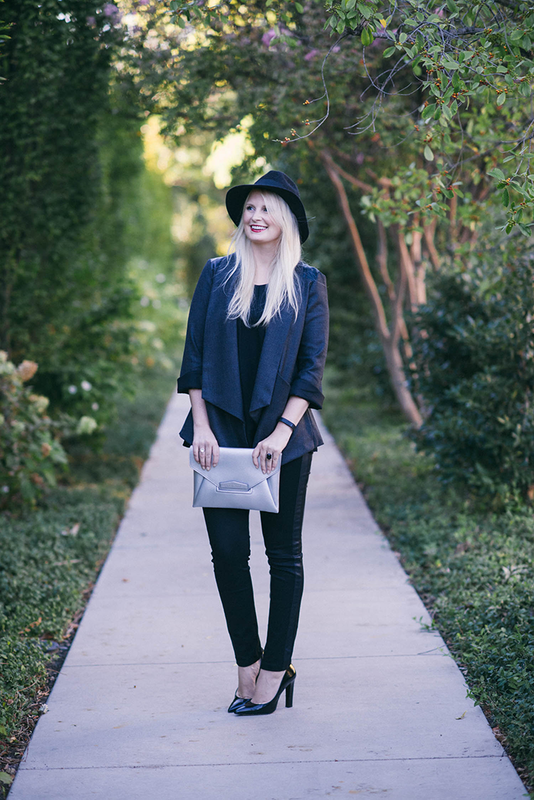 Stunning looks – the Morgan James jackets are awesome!!! You really need to share this post with us at TREND SPIN – FOOTWEAR this week. Hope to see your pretty face there!